Does shape of glass effect how fast you drink beer? “Glass shape influences consumption rate for alcoholic beverages” reports a research. Does shape of beer glass matter? 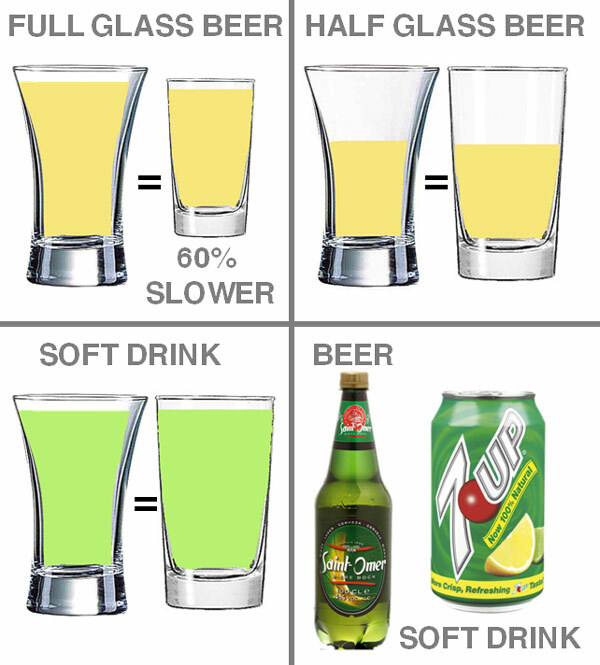 People drink beer 60% slower from a straight glass in contrast to a curved glass (convex). Interestingly, people were slower drinking full glass but not a half-full glass of beer. This effect was also not seen for a non-alcoholic drink. For experiment, volunteers drank either Biere de France (4% alc.) from Brasserie de Saint-Omer brewery or 7-Up chilled at a same temperature. They drank while watching BBC documentary Earth: The Journey of a Lifetime to avoid any difference in drinking rate due to external factors. Don’t we all drink faster during a boring conversation? Why does shape of glass matter? This is a first study to show that subtle factors such as shape of glass directly influence drinking behavior. Researchers believe the difference is perhaps due to the fact that people pace their drinks, especially alcoholic beverages. The curved nature of glass skews people judgment on how much of drink has been consumed up to the mid-point. However, more research is needed. So my question is will you drink your beer from a curved or as straight glass?